Comeback story: 10-year-old Stump retired from show life after he nearly died in 2004. Five years later he's Westminster's top dog. This old dog taught Westminster a new trick. 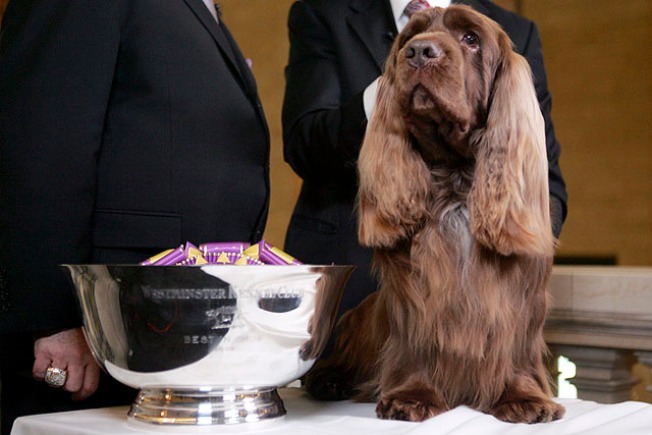 At 10, a Sussex spaniel called Stump became the oldest best in show winner at America's top canine competition, coming out of retirement last week and taking the big prize Tuesday night. "He hasn't slowed down a bit," expert handler Scott Sommer said. "I thought it would be fun." A nearly full crowd at Madison Square Garden cheered loudly when judge Sari Tietjen pointed to the new champion at the Westminster Kennel Club. Perhaps the fans knew Stump's backstory — he left the show ring in 2004 and later nearly died from a mysterious medical condition. The vets at Texas A&M saved him. "It was miraculous," Sommer said. Sommer said Sussex spaniels can live to be 15. Never before had a dog from this breed won the show. The previous oldest winner was an 8-year-old Papillon in 1999. The Resident from http://www.theresident.net went to the Westminster Kennel Club Dog Show at Madison Square Garden to ask handlers, attendees, judges, and even the dogs themselves what the event is all about. With floppy ears and a slow gait, the golden-red Stump beat out a sparkling final field. Sommer guided him past a giant schnauzer that was the nation's top show dog, a favored Brussels griffon, a Scottish deerhound named Tiger Woods, a standard poodle with 94 best in show wins, a Scottish terrier and a puli. After he won, Stump showed off his one trick: He got up on his hinds, as if he was begging. He didn't have to, he was already No. 1. But with a bounce in his step, Stump is sure to win over plenty of people while he reigns for a year and gets extra playtime with his green Grinch toy. "He really is retired this time," Sommer said. Once he recovered, Stump mostly spent his days hanging out with Sommer, living a dog's life. That was more than fine with Sommer. He'd handled a great Bichon Frise called J.R. to the best in show at Westminster in 2001, and wasn't looking for Stump to try again. "Can you believe that?" said New York Yankees president Randy Levine, a regular at this event. There was more in store, too. Stump lives with J.R. at Sommer's home in Houston, and may've gotten some advice. "J.R. must've told him this morning, 'Keep up the family name,'" Sommer said. Pacifying this active breed — among the two the Obamas are considering — isn't always easy, even with a big yard and a big staff. It sometimes takes an extra treat. Clas wouldn't mind having one as a neighbor — he lives in Thurmont, Md., near the presidential retreat of Camp David.